All rooms are well lit and ventilated and guests can enjoy a comfortable dinning room. Our bathrooms are modern, and all guests can enjoy the use of the kitchen. With the congestion tourist can experience in a city with small winding streets, Silk Road Property is a welcome escape. Set on Fondamenta Delle Zattere, Silk Road property sits on a long and wide promenade, popular for evening walks, dinning, or grabbing a gelato and watching the sun set. The structure has been completely restructured and provides wide spaces, large rooms, common areas , equipped kitchen for guests. Late Check-in from 22:00 to 23:00 will cost 10€ per person. Late Check-in from 23:00 to 24:00 will cost 15€ per person. Late Check-in from 24:00 to 1:00 will cost 20€ per person. Clean, beautiful hostel with a great view of the water from the windows. I love this hostel. The room and common area are clean, spacious, and comfortable. It has a great location of being 2 mins walk from the Grand Canal. It feels amazing to just open the window and see the water. The staff is super helpful, kind, and patient. Would stay here again if I visit Venice. Had a great stay at The Silk Road while in Venice for Carnevale. Perfect location— near a handful of great restaurants and bars and wonderful view of the water. Only a few rooms and two bathrooms but very convienant for a night or two. 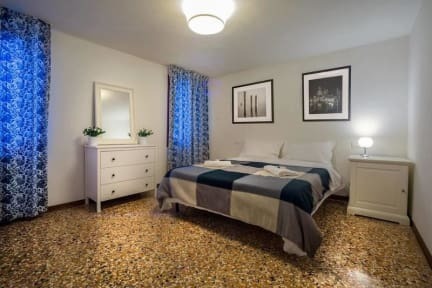 This hostel is located on the southern coast of Venice, about a mile from the train stop and St Mark’s square right on a major canal, near a water bus, grocery store, restaurants, and bars. A great location to be a little separate from the throngs of tourists. The hostel was quite clean and exactly what I was looking for in Venice. Highly recommend it! Very nice hostel and perfect location on the Grand Canal for a trip to Venice. It was clean, spacious and the beds were comfy, what else could you ask for? A nice quiet hostel right by a water taxi station and not too far of a walk from the tourist attractions. Good location, but almost unfriendly cold atmosphere, and annoyingly unavailable staff. If you just need a bed and shower, this is ok. But you're not gonna meet any interesting people here. Dont believe the many positive reviews this hostel has.I fell for those reviews. THEIR BEDS HAVE THEIR OWN LIVES,THEY MOVE ON THEIR OWN,THEY ALSO MADE IT APPEAR LIKE IT'S WALKABLE FROM STA LUCIA BUT ITS NOT SPECIALLY IF YOU HAVE A LUGGAGE AND YOU'RE NOT FAMILIAR WITH THE ALLEYS AND THE WORST PART IS THE LADY AT THE RECEPTION AND I THINK SHE ALSO RUNS THE PLACE WAS VERY CONDESCENDING.SHE WOULD SAY SOMETHING LIKE"You listen so you dont ask questions later.She is also very controlling.